Translate into English is framed with grammatical instructions from a turn-of-the-century Spanish lesson book. Possessing a rare elegance and integrity, Cellini’s poems are intelligent and clever while capturing subtle emotions. From the compelling concept to the fine execution of these poetic vignettes—each work, each poem, every page is necessary to the whole. And the whole is a unique and beautiful experience. No es cosa fácil el escribir un buen poema. The wind blew a few syllables under the crack of the door. A few syllables, perhaps a phrase, that’s it. February’s fury. Some consonance. A subtle rhyme. Through the window in the door, the last elm moves in the storm, but there is plenty of firewood inside. The end is a surprise. Or a twist. You see, it’s not easy. Especially with the wind. It’s not easy writing a good poem. 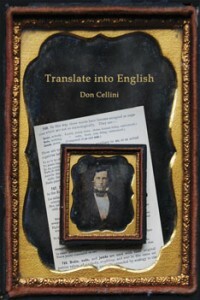 Don Cellini is a poet, translator and photographer. He is the author of Approximations/Aproximaciones (2005) and Inkblots (2008), both from March Street Press. His book Elías Nandino: Selected Poems (McFarland, 2010) is the first comprehensive translation of the poet into English. He is a recipient of fellowships from the King Juan Carlos Foundation and the National Endowment for the Humanities. He teaches at Adrian College in Michigan.